Tour includes South and Western regions for the first time in years! New London, CT – Wishbone Ash, one of the most influential guitar bands in the history of rock, returns to North America this Spring with brand new tunes from their upcoming release, Blue Horizon. The group returns to these shores following last year’s annual tour through the the East, Midwest, Northwest and Western Canada, where they delighted fans with high-energy performances featuring a vast catalog spanning 45 continuous years of music-making. The 2014 Spring tour has been nicknamed “The Blue Horizon Tour” to coincide with the March US release of Blue Horizon and celebrate the return of the band to areas not visited in many years. “I thought, why not ring the bell to see if our fans in the South and Southwest would come out and join the party,” says bandleader and founding member Andy Powell. The first leg of the tour begins April 15 in Florida and winds south and west before heading northward through the Pacific West Coast and Canada. 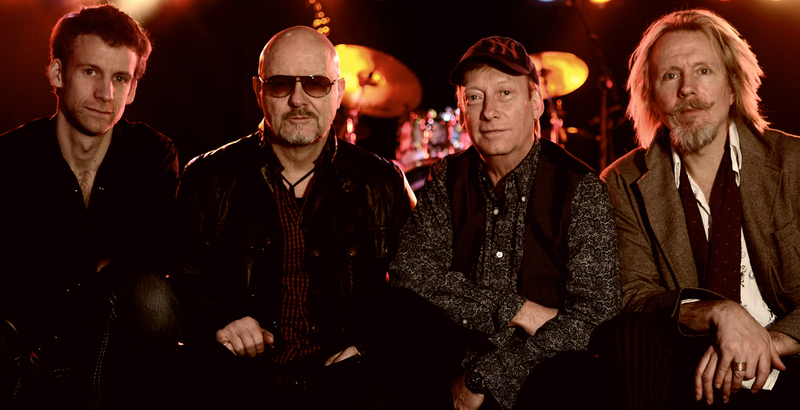 Formed in 1969, Wishbone Ash has to its credit 24 original studio recordings, 10 live albums and four live DVDs along with a DVD rockumentary (“This is Wishbone Ash”). The band is led by founding member Andy Powell on guitar and vocals, trading licks with Finland’s guitar wizard Muddy Manninen. Bassist Bob Skeat, a 17-year veteran of the band and in-demand studio musician, sets the pace with Joe Crabtree, one of the best of Britain’s new breed of drummers whose performance credits include Pendragon and David Cross of King Crimson. “The band basically lives together year-round, so we have a very strong level of communication that translates in our performances and recordings,” says Powell. Wishbone Ash’s new album, Blue Horizon (Solid Rockhouse Records), includes guest artist Pat McManus playing fiddle on two tracks. Fans will recall McManus made an appearance on 2011’s Elegant Stealth and also co-wrote one of the songs, “Can’t Go It Alone,” with Andy Powell. Blue Horizon features two songs written by Aynsley Powell (Powell’s son) and one by former Wishbone Ash guitarist Roger Filgate. “This band is like a fine wine that just keeps getting better with age and this is one of their strongest studio releases in years,” said Keith “MuzikMan” Hannaleck of MuzikReviews.com. “The songs are catchy, very technical, but there is a soul in what Wishbone Ash is doing!” said Mark Kadzielawa of 69 Faces of Rock. Lynyrd Skynyrd cites Wishbone Ash as a primary influence on their style along with Thin Lizzy, Iron Maiden and, more recently, heavyweights like Opeth and some of the guitar-based Indie/Alternative bands. All have been transformed by the original, legendary twin-guitar approach of Wishbone Ash. There is no other rock band on the planet that has done more with the twin guitar concept than The Ash. This entry was posted on Monday, March 17th, 2014 at 23:27	and posted in Press Release, Wishbone Ash. You can follow any responses to this entry through the RSS 2.0 feed.